Mobile Apps also work offline, that is, when you are in the underground, when you are traveling fast (i.e. with a shaky data connection), etc. and being online over wireless networks is still expensive. Yes, with HTML5 you can also run applications offline, but this is not that frequently available. And as Facebook moving from a HTML5-based application to a native iOS app showed, the user experience is challenged. But working offline also extends to storing the content and context of the application even when not connected to a central server, making it the better / only choice for application with a lot of local data. And apps are the ultimate way of personalizing the “menu” structure of your smartphone. While many attempts to enable menu personalization on feature phones have fails, apps finally make it possible to arrange functionality on the home screen of your device according to your personal need. 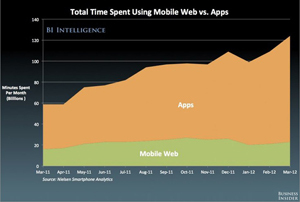 So I believe we will still see cloud-enabled, multi-device mobile applications continue to grow for some time. An interesting, scientific study published by Stanford University suggests that using examples (i.e. copy prior work) early on in the creative design process improves the creativity of the output. The emphasis here is on, early in the process. Using prototypes and repeated look at examples improved the output even further. However, using examples also increased the conformity of the output. Also interesting considering the outcome of the Apple vs. Samsung case. At Google 20% of time spend on projects out of the daily work and some innovation rules, create a playful environment to try things out with the assumption that at some point something important will arise. Recent examples are Google Goggles and the Driver-less car. So this is the playful design approach. Let many smart people in small projects try something out and eventually something great will happen. In parallel the new book by Ken Segall: “Insanely Simple: The Obsession That Drives Apple’s Success” gives some insight into Apple’s design philosophy around “small teams of smart people”. Designing the end-user experience from end-to-end with a small team – no focus group research – has created some of the coolest and market-changing or rather market-defining products in the last decades. Obviously the designful approach, with a small and focused team designing the complete product and user experience also works successfully. These 2 approaches very much focus on small teams of smart people, but as an additional dot to connect to here, I was at an interesting event organized by Lithium, maker of a community and social media platform enabling companies to create brand followers and communities. One of their key examples of community driven product design – and one that is very close to my daily work – is UK-based Mobile Operator giffgaff. They did not start with launching a service, but with launching a community platform that allows potential future users to define their tariffs and products. Once they had this defined, they started operating their services. Fully outsourcing the product definition to users. Crowdsourcing product design and innovation seems to become more popular across industries and proves to have some merits. I don’t have a clear answer on which approach is better, because for all there are successful examples. It also very much depends on available resources, market and industry. Especially interesting for me is to understand, how these approaches work in the Business-to-Business (B2B) space. So now back to the questions: what’s your design approach? It just seems that Google wallet is taking some personal (via AllThingsDigital) – Head of Consumer Payments resigning – and functional (via GoogleCommerce) – security concerns about mobile payments – roller-coaster ride early this year. Today news (via Mobile News) came out about Barclays launching a mobile transfer service, working with a simple application on smartphones. A great first mover advantage, if they can maintain the uptake and integrate other banks and credit cards into the program. Otherwise it will get hard for the consumer to manage all the different applications on the phone. It also seems to be a great thing for merchants selling small items. I came across Stripe recently – there are probably more companies like it – and was fascinated how easy it seems to setup payment for websites today. Some interesting summary and opinion in VentureBeat about the uptake of mobile payment in the retail industry. Yesterday already started with some interesting insights into mobile security with the report in the New York Times on security measures companies implement when employees travel to China or Russia. These measures include leaving mobile phone and laptop at home and using dedicated devices, not using WiFi or Bluetooth, removing batteries from phones while in negotiations etc. All in fear of electronic espionage on or via mobile devices. In parallel in a recent survey among 150 leaders in the industry on “biggest mobile stories in 2012” the topic “Security and Privacy” made it only to 6th place, with roughly 23%. Although in the “what was most newsworthy in mobile in 2011” it came out last with only 2%. Now on the Mobile Monday we had great presentations and demos, most notably by MobileIron, on Mobile Device Management and Mobile Security. The focus of all presentations, however, was on corporate customers and how to protect corporate data and intellectual property. On the other hand there are all the stories floating around of making the smartphone the single device for payments by integrating credit cards and bank accounts into a mobile wallet, e.g. square card case. With NFC smartphones are also assumed to eventually replace the key for access control. With all these information stored on the smartphone, loosing such a device becomes a real nightmare. But following the electronic spy story at the beginning, hacking into mobile phones and stealing information might be an even bigger threat. While it might be true that people realize the loss of their phone earlier than the loss of the wallet or keyring, when credit card or access credentials are electronically stolen from a device the user might not notice this at all. While focusing Mobile Device Management solutions on corporate customers might make perfect sense at the moment, there is definitely an opportunity there for offering private mobile phone protection. And mobile operators are definitely in a position to leverage their customer relationship here. The only major challenge, besides the issue of how to make this easy to use across different scenarios, is around marketing. In order to sell security solutions you need to paint a clear picture of the threat, while painting it too vividly might actually shy people away from using the smartphone for such applications. So add Mobile Security and Privacy on my list of key topics to watch for 2012.